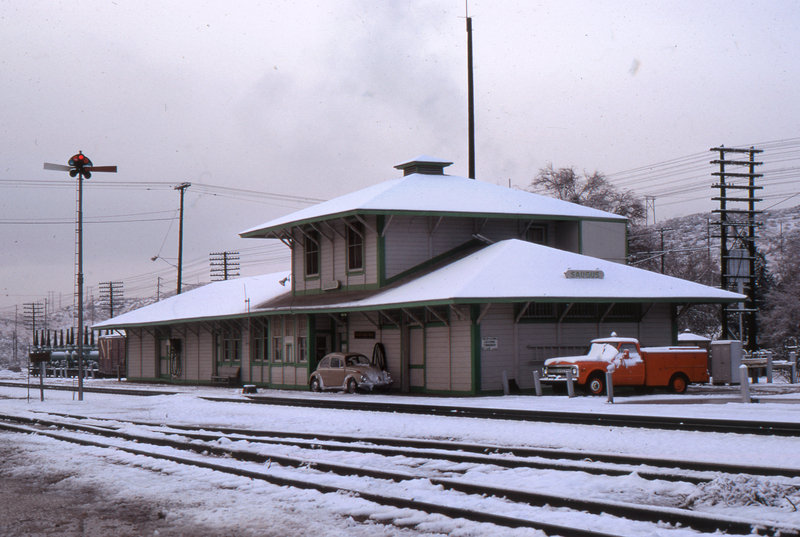 SCVHistory.com AL7001 | Newhall | SPRR Saugus Depot in Snow, 12-19-1970. At the time, the Saugus depot stood at the southeast corner of Bouquet Canyon Road and Drayton Street. It was occupied by the Guthrie family; Bob Guthrie was the station agent. See and read about the Guthries here. The photo was shot by local history and railroad enthusiast Gordon Glattenberg, later editor of the Santa Clarita Valley Historical Soceity's (est. 1975) monthly "Dispatch" newsletter. AL7001: 19200 dpi jpeg from color transparency | Collection of Dr. Alan Pollack.